Have you ever had an instance when you unexpectedly had a feeling and became emotional? 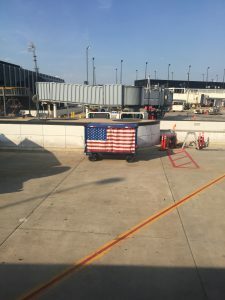 I got onto an American Airlines flight recently; sat in my seat; opened the window shade, and saw the American flag draped the front of a luggage cart. It probably didn’t help that I was listening to Miranda Lambert’s song, “The House that Built Me,” but I started to tear up. I couldn’t help but think about how lucky we all are to be in this great country. Listen, I get to live my purpose of positively impacting lives every day! Why is this possible? We have servicemen and women all over the world carrying out orders and risking everything so you, I and every American can chase our passion. Then my mind wandered into that question you’ve asked or have been asked: Where were you on September 11, 2001? How many of those Americans who lost their lives that day were just going to school, work, see a family member or vacation? Furthermore, how many Americans saw the images on TV and selflessly decided they were going to go overseas to make sure this never happens again? With Memorial Day, the Fourth of July, Patriot Day and all the other American celebrations and remembrances throughout the summer months, we have ample opportunity to reflect on why we’re all so lucky to be American. We can also go one step further; take action and positively impact America’s heroes and their families. They sacrificed so much for us, and it’s our turn to give back! There are so many amazing organizations out there that need our support. Two of the nearest and dearest to Medix’s heart are Jared Allen’s Homes for Wounded Warriors and Camp Hometown Heroes. I invite you to please check out these and any other military organization this summer! I’m blessed every day with having an amazing family at home and work. It’s really easy to wake up every day and run fast in pursuit of our goals. But let’s not forget those who motivate us to keep going; run fast for our country, family, those here and gone. This entry was posted in Clients, Currently Employed, Job Seekers and tagged America's Heroes, Military, veterans. Bookmark the permalink.